Attention, all you goal setters! Have you ever been so focused on a goal that it consumes your every thought? You can “see the end from the beginning” and you forge ahead obsessively. There’s a magic to that, but there’s also an unfair illusion at the finish line. When you finally succeed in reaching your desired result, you learn that the “prize” wasn’t really the prize at all. The sports championship, the college degree, the boot camp, the big business promotion . . . these are a few examples of desired outcomes. Imagine, for a moment, a world where you could just “have” these goals. You don’t have to actually compete for the championship – they just give everybody a trophy on opening day. College degrees? They just pass them out on the first day of kindergarten. No need to go work out at the gym. They’ll just declare you “in shape” and use fun house mirrors. And your business promotion, or big money goal? Here ya go! Talk to the people who have achieved these things in life. They’ll mostly concur that the end result, while gratifying, was often anti-climactic. They’ll tell you that the “real prize” was what they experienced and endured (good and bad) during the journey toward that desired goal. The sports championship means nothing without the practice, the battles, the wins and the losses. The champion will tell you that it would have been boring to win every time. I have yet to meet a college grad who values the “piece of paper” more than the fun, the friendships, and the education attained. And in most cases, those experiences and relationships are far more valuable. And the business achiever is usually more proud of the person he (or she) has become after experiencing all the trials and tribulations involved with winning; The ups and downs, the people, the lessons of personal development, and the memories. Steel is forged by fire. So get up, dust yourself off, and stop wasting energy worrying about how long it might take you to reach your goals and dreams. Laugh at the world when it throws you a curveball. 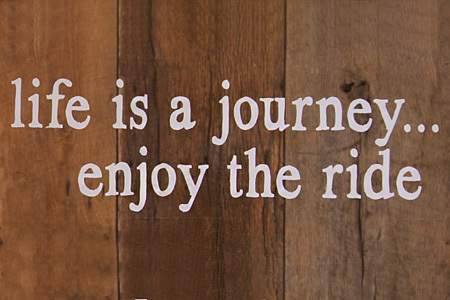 And most importantly, stay focused on the road and enjoy the ride! The journey is the prize. We’ll put– It’s not the destination, it’s the journey.